Baronscourt Estate in County Tyrone has one of the largest herds of pure Sika deer in Ireland with the gentle flavours of its naturally wild venison recently seducing the UK’s Guild of Fine Foods equivalent of the Booker prize’. 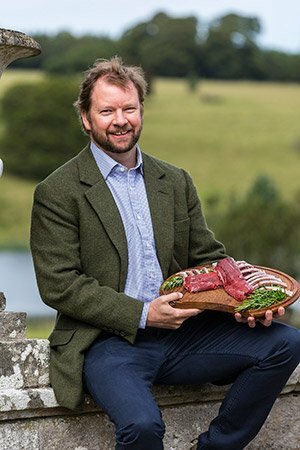 As part of Northern Ireland Year of Food and Drink 2016, Lord Hamilton, who is directly involved in the running of Baronscourt’s game food business, speaks of his love for the 400-year-old Estate which is also his ancestral home. Lord (Jamie) Hamilton loves to cook for his young family who are all “huge venison fans” and – happily coinciding with August’s ‘Love NI Meat’ – reveals their “special meal” features freshly prepared venison French rack. Asked what he loves most about Baronscourt, historic seat of the Duke of Abercorn since 1612 located in the foothills of the Sperrins at Newtownstewart, Lord Hamilton said: “It is very hard to point to a single facet that I love most about Baronscourt Estate but it’s essentially the people whom I work with and the community that I live within, as without them the Estate would not be as it is. “I am particularly proud of our game food business as the growth in venison sales is something we have really excelled at in a very short period of time. Providing a really healthy, sustainable food which has been awarded such great feedback and commendation from the top food judges in the UK has been very gratifying. Further commendation followed in 2015 and just recently Barsonscourt Estate was again awarded in 2016 one gold star for its renowned venison French rack. Baronscourt’s lakes, pasture, woodlands and heather moorland provide the ideal habitat for the highly prized Sika deer to live and breed. Throughout the year they feed on succulent myrtle bog, ryegrass and tasty saplings which are naturally free of any additives or growth promoters. The Estate has been producing game and venison for the commercial market for a number of years and recently invested in facilities to improve its packaging and labelling, as well as being able to produce more sophisticated cuts and products such as the French rack of venison and burgers and sausages. Explaining the importance of sustainability for the business, Lord Hamilton continued: “The Estate is over 400 years old and we are very much planning for the next 400 years! Sustainability runs through everything we do, whether it is through our forest management which is undertaken in accordance with Continuous Cover Forestry management principles, to the rearing of game on the Estate for sporting purposes. Baronscourt’s venison and game is supplied to individuals, restaurants and wholesalers throughout Northern Ireland, with products also sold into other markets such as the Republic of Ireland and Great Britain. “We have in the past supplied the prestigious Fortnum and Mason store in London, who experienced huge demand for our wild venison,” said Lord Hamilton, who added that traceability is also paramount. Lord Hamilton acknowledged that the culling of deer can be an emotive issue for many people. “For those who are perhaps adverse to eating venison because of the beauty of the deer, they should understand that those of us who live and work on the Estate are the strongest advocates for the preservation of the deer and the protection of their health. “However, like all things in life a balance must be struck and, given the Sika deer’s ability to reproduce prolifically in this part of the world, the numbers have to be controlled in order to reduce the substantial damage they can cause to trees, crops belonging to both the Estate and our neighbouring farmers, and the risks to life posed to those who travel the roads in the vicinity of the Estate. “In addition, a deer herd left uncontrolled can increase to levels which can cause damage to the overall health of the herd itself due to their forage habitats becoming over-exploited, leading to a decline in the condition of the animals. Baronscourt Estate has two self-catering holiday cottages – the Governor’s Lodge and the Clock Tower – located in the historic Stable Yard. Tourists staying on the Estate can enjoy walks around the grounds and, by private arrangement, avail of tours of the House and Gardens. “The Ulster Way crosses the Estate and this is popular with hikers and walkers alike. We also have salmon fishing on the River Mourne and pike fishing on the lakes on the Estate. 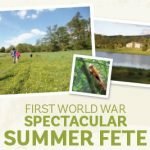 We welcome visitors from Europe and further afield who come stalking or shooting and we focus on ensuring that our offering is the very best it can be and have established a reputation for excellence as a result. “The food offering plays a large part in this as clearly Northern Ireland is becoming widely acknowledged as the home of great food and we are proud to be able to play our part in this story through our game and venison. “The Estate’s salmon fishery includes the famous Snaa pool where the salmon rivers of the Strule and the Derg meet to form the River Mourne and 2016 has so far been an excellent year, with salmon up to 20lbs in weight having been caught. Mary Blake, Tourism Development Officer with Derry City and Strabane District Council which is actively supporting Tourism NI’s year-long campaign through a range of events and initiatives, paid tribute to Baronscourt’s success with its award-winning local venison and key role in promoting the area as an international tourist destination, attracting hundreds of visitors each year.